Today we have a guest review from Jason Maust. I don't do enough with Transformers, I admit it. So I'm always happy when someone offers to help me out on that score - here's a great review of the new Optimus Prime, part of the new Robots in Disguise. Take it away, Jason! Hello everyone, this is my first (and hopefully not last) guest review for Michael and the best toy reviewing site I have ever come across. Thank you for letting me do this, Michael. If you are anything like me, then you grew up with Optimus Prime sitting on the nightstand next to your bed. Transformers, along with G.I. Joe, was more than just a cartoon show at that age, it was a way of life. Your entire day was based around watching it and then begging the parental units to go to a toy store to buy what you saw. Now Takara’s most recent series in Japan, Car Robots, is coming to America as Robots in Disguise, and I was super excited at the prospects of having Transformers that weren’t stupid monkeys and spiders (I hate BeastWars). So the very first thing I did was buy myself the big guy himself, Optimus Prime. WARNING: Many comparisons to the original toys follow! This time, Prime is a fire truck who turns into a robot (normal Optimus Prime), a robot with huge missile launcher shoulder pads (very, very, very cool looking and is the one in the picture) and then super big Ultra Prime (which I have mixed feelings toward). The ladder can also become a base and it has small battery powered lights and fire engine sound. 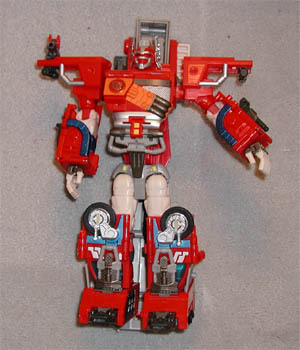 It can also be combined with Ultra Magnus to form Omega Prime. 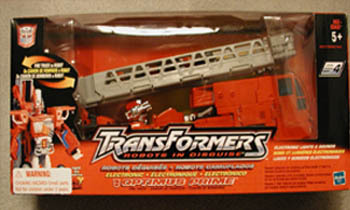 The packaging is attractive with the black fading to red color scheme that all of the new Transformers feature. The box is easy to open without damaging it and the bubble gives you a decent view of Prime in fire truck mode. However, I have a feeling the bubble is very prone to denting and discoloring. My biggest complaint about the box is that it is multi-lingual. Now I am not prejudice against those who speak French and Spanish, but it makes the box incredibly crowded. The back of the box is one big block of writing, each paragraph re-written twice in foreign languages. Not only does it clutter the aesthetics of the box, but also less information about the series and the character is given as a result. 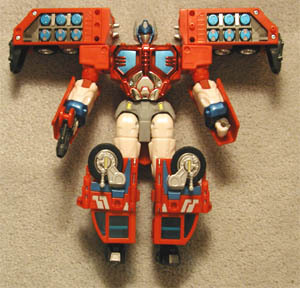 All Prime comes with is a truly sad gun (it looks like a water pistol), the lights, and some missiles that fire from the ladder portion in rapid succession. Now, Transformers in the past did not come with a whole lot, but the original Prime came with a truly awesome gun that inspired fear in evildoers everywhere. This gun looks like it should be at a Disney water park. The gun alone loses 2 stars. I also deducted points because the new Transformers HAVE NO STICKERS!!!! This is a travesty. No huge sticker sheet with tiny stickers numbered 1 through 312. Now I guess this makes it kid friendly, but still, that is the one accessory that came with the originals that occupied the most time. The sculpting is excellent, especially on the smaller Optimus Prime with the big shoulder pads. 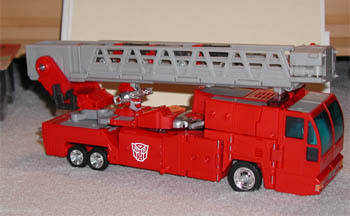 In fire truck mode, the truck is pretty good looking, except that you can clearly see Ultra Prime’s head sticking up. No attempt to hide it was given what-so-ever. The sculpting is pretty good in Ultra Prime mode. The design on his chest is very nicely sculpted. The only downside is that the 2 blue front windows that appear on the smaller Prime did not transfer to Ultra Prime. Also, the head is kind of goofy looking, but you can get use to it…maybe. The paint is very good on Optimus Prime, however most if it is molded in the red plastic, so it should be good. Not too many instances of overlapping paint, but a few places here and there. As I mention below, there are no stickers, so most of the color on Prime is very plain. There is some chrome paint in red, blue, and silver that looks very nice. One disappointing part is that there are only 3 Autobot symbols painted on him. None of them are on the right or left shoulder facing forward, like on the original. While this can be forgiven, none of them are particularly visible in robot mode. Now, Ultra Prime is just as articulated (YAY), however if you try and move the parts in any kind of fun manner, his hands will fall off or his feet will come off (BOO). Plus, since the ladder extends down his back to the ground, you can’t really bend his knees anyway, because it is too long. Why only two stars? Do you remember Rubik’s Cubes? Well, now imaging one that turns into a robot. From fire truck to robot mode, the transformation looks easy enough, but everything has to move in just the right way for it to work. Plus, parts of the legs feel as though they are going to snap clean off if you push too hard, but it’s clearly the only way to make it work. No breakages yet, thank goodness. Robot to Ultra Prime mode is very easy, but the right foot almost never stays on and the left hand constantly falls off. Very aggravating. Also, unlike the original, there are a lot of parts that have to be taken off and then snapped onto another part of the robot. The originals were self-contained, nothing came completely off and that is the way I like it. I have seen them going for $34.99-$39.99 most places. While this isn’t too bad, Megatron was $10 cheaper. Now there is a lot more to Prime, but still, wish it was cheaper. Now I complained a lot about Ultra Optimus Prime, but I truly think the smaller version of Optimus Prime with the giant shoulder pads makes this worth buying. It is a great mold of Prime that matches the style and look of the original. If for no other reason, it is worth getting it for that robot mode. Get it for big Ultra Prime at your own risk, don’t say I did not warn you. You can find Optimus Prime at Toys R Us and currently at Walmart as well. Then of course there is also eBay. If anyone has any comments on the review, feel free to email Jason at maust@madisoninnovations.com.